1 package contains 75 Gr. Red Rice Yeast. Red yeast rice is what is referred to as a "koji" in Japanese, meaning "grain or bean overgrown with a mold culture", a food preparation tradition going back to ca. 300 BC. In both the scientific and popular literature in English that draws principally on Japanese, red yeast rice is most often referred to as "red rice koji". English language articles favoring Chinese literature sources prefer the translation "red yeast rice." 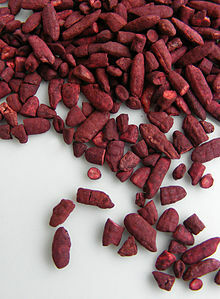 Red yeast rice is produced by cultivating the yeast species Monascus purpureus on rice. The rice is first soaked in water until the grains are fully saturated. The raw soaked rice can then either be directly inoculated or it can be steamed for the purpose of sterilizing and cooking the grains prior to inoculation. Inoculation is done by mixing either M. purpureus spores or powdered red yeast rice together with the rice that is being treated. The mix is then incubated in an environment around room temperature for 3–6 days. During this period of time, the rice should be fully cultured with M. purpureus, with each rice grain turning bright red in its core and reddish purple on the outside. 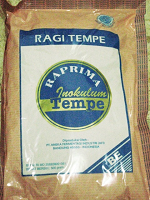 Red Rice Yeast is prepared by cooking rice with water, cooling and inoculating the cooled rice with red rice yeast. The amount of yeast is added. The yeast powder is stirred in the cooled rice-mix, and then the ingredients are placed in a covered bowl and fermented at room temperature [about 85 F] for 1 - 6 days. We include detailed instructions how to make Red Rice Yeast.